FILE - Tyler Hubbard, right, and Brian Kelley, left, of Florida Georgia Line, join Bebe Rexha to perform "Meant to Be" at the 53rd annual Academy of Country Music Awards at the MGM Grand Garden Arena in Las Vegas. We're connecting with the five most popular songs in the Billboard Hot 100 Pop Singles chart, for the week ending May 26, 2018. Surprise! We get a Hot Shot Debut in the No. 1 position. Three consecutive champion songs have opened at the top — something that hasn't happened in 23 years. No. 5: Bebe Rexha & Florida Georgia Line "Meant To Be"
But let's start in fifth place, where Bebe Rexha and Florida Georgia Line slip a slot with "Meant To Be." Meanwhile, it tops the Billboard Hot Country Songs chart for a 25th week, moving into second place on the all-time list. Sam Hunt owns the record: 34 weeks at the top with "Body Like A Back Road." Speaking on May 20 at the Billboard Music Awards, Bebe said she would love to work with other country artists and is excited about the June 22 arrival of her first full-length album, "Expectations." 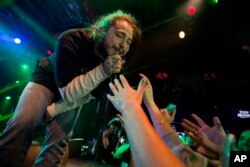 Post Malone performs during Snow Fest at Park City Live on Jan. 20, 2018, in Park City, Utah. No. 4: Post Malone & Ty Dolla $ign "Psycho"
Post Malone and Ty Dolla $ign back it up two slots to fourth place with "Psycho." That makes it an all-rap Top Four … and that's a significant chart development. That hasn't happened since 2009, when the chart featured, in descending order: Flo Rida's "Right Round"; T.I. 's "Dead And Gone" with Justin Timberlake, Eminem and Dr. Dre; 50 Cent's "Crack A Bottle"; and Kanye West's "Heartless." 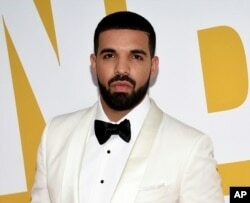 FILE - Canadian rapper Drake arrives at the NBA Awards in New York. No. 3: Drake "God's Plan"
Drake holds in third place with his former 11-week champion "God's Plan." Drake and Migos' upcoming joint tour is shaping up as one of the hottest tickets in North America this summer. New dates have just been added in Drake's hometown of Toronto, along with Chicago, New York, Dallas and Los Angeles. The "Aubrey And The Three Amigos" tour kicks off July 26 in Salt Lake City, Utah. 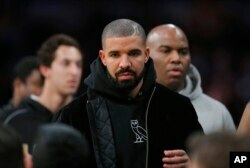 Rapper Drake attends an NBA basketball game between the Los Angeles Lakers and the Oklahoma City Thunder, Dec. 23, 2015, in Los Angeles. No. 2: Drake "Nice for What"
Drake ends a 15-week run at No. 1, as his second consecutive champion "Nice For What" dips a slot to second place. Speaking on the Rap Radar podcast, the song's producer, Murda Beatz, said that they were at Drake's house playing the "NBA 2K" video game when they came up with the idea for the song. They decided to sample "Ex Factor" by Lauryn Hill, wrote the lyrics, made the beat, and finished the whole thing in about 90 minutes. 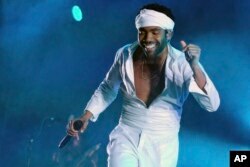 Donald Glover who goes by the stage name Childish Gambino performs on day two of the Governors Ball Music Festival on June 3, 2017, in New York. No. 1: Childish Gambino "This Is America"
For the first time in 15 weeks, we have a Hot 100 champion not named Drake. Childish Gambino opens atop the hit list with "This Is America." Propelling this song is the hard-hitting video, which first aired on the May 5 edition of Saturday Night Live. Childish Gambino — the musical alter ego of actor Donald Glover — will go on tour in September with Rae Sremurd and Vince Staples. We'll have a new lineup for you next week, so be sure and come back.